Pupils from local primary schools had plenty of opportunity to practise their ‘français’ at a fun-filled French day at The Grammar School at Leeds (GSAL). The year 5 pupils immersed themselves in French language and culture when they visited GSAL Junior School, including dressing up in the colours of the French flag, watching a play Bon Voyage performed in French by the Flying Theatre Company and learning a French rap song. As well as year 5 pupils from GSAL Junior School, visiting pupils from four other schools took part in the fun French day – Scotton Lingerfield Primary School, Knaresborough, St Nicholas RC Primary School, Gipton, St Oswald’s C of E School, Guiseley, and Froebelian School, Horsforth. And there was a surprise in store for four of the St Nicholas pupils, in particular, when GSAL principal Sue Woodroofe dropped in to chat to the children. 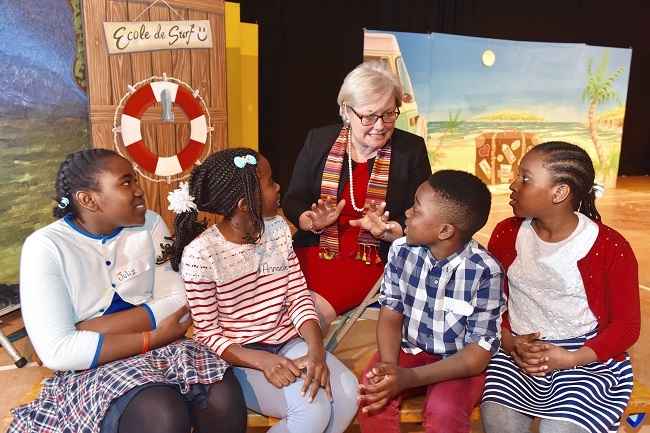 Mrs Woodroofe, who spent a number of years as head of the British School of Brussels (BSB), was delighted to have the chance to use her French again as she ‘parleyed’ with the youngsters, who all speak French at home. The activities were led by Vicky Cooke, GSAL Junior School French teacher, with help from language teachers and assistants from Senior School, along with sixth formers who are studying French at A-level. Image: Principal of GSAL Sue Woodroofe is pictured with (L-R) Juliz, Annaelle, Anghy and Ashlyn from St Nicholas School.